On May 25, 1869, you join the crew of one-armed Civil War veteran John Wesley Powell along with eight other fellow veterans, hunters and trappers, in an attempt to be the first to navigate the Colorado River through the vast unmapped maze of canyons in the heart of the Great American Desert. 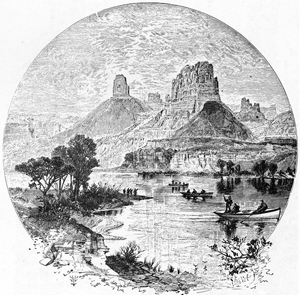 You are well aware that no European-American has boated the formidable Colorado River – not, at least, and written about it. Turning inward... this is, perhaps, the final American frontier, a terra incognita. Will you, Mr. Bradley, be among the first of the new Americans to see it? Voyage Into The Unknown is designed for 1024X768 or greater. If you have a small screen please go into FULL SCREEN viewing mode in your browser. You are entering a very wide landscape; if you have a smaller screen size you will need to scroll more to travel into the landscape -- use all the space you can get! © Roderick Coover, 2008. All rights reserved.